In developed and civil countries where the rule of law is adhered to, an abusive spouse will automatically lose his or her job at the slightest knowledge of it by his employer. Unfortunately not in Nigeria and as much as you would expect Zenith Bank, an international conglomerate to adhere to this international standard, you had be disappointed too. Such is the case at hand where a Zenith Bank’s senior staff and Risk Management manager for that matter allegedly bartered his wife to near death, and over 5 months on has continued to keep his job. All efforts to get Zenith Bank to at least investigate their staff has failed on deaf ears. Ivie and John Edobor have been married for 9 years and out of those years have been separated for 2 years. Their union has 3 beautiful girls. Ivie was Head Human Resources with a Telecom company while the husband, John Edobor is a senior staff at Zenith bank till date. 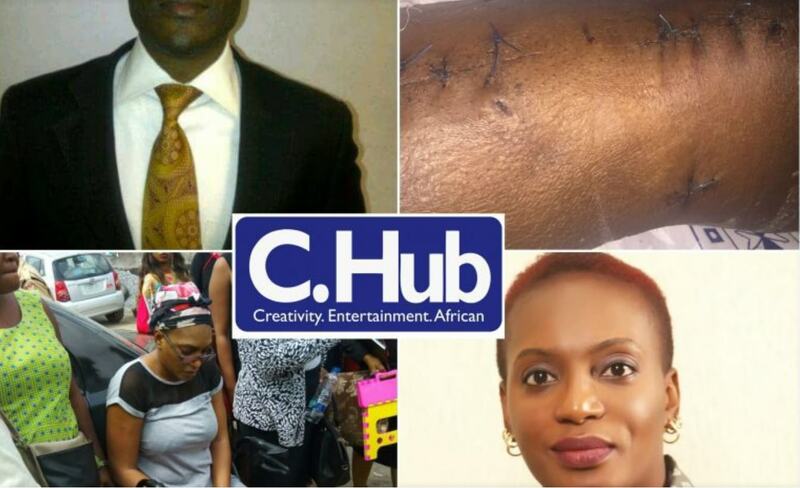 However, in the last 5 months, Ivie has been placed on compulsory leave because she can’t walk and can no longer cope due to injuries sustained from an alleged attack by the husband, John Edobor of Zenith Bank. Although the couple had been separated, their fight continued. According to Ivie, her husband threw her out of their family house allegedly because when her business failed, she incurred lots of debts which John vehemently refused to help her settle. He refused to take care of the children, their school fees and upkeep. On some occasions, Ivie and the kids have had to sleep in the car, hotels etc. Her brother in-law also tried to accommodate them but, John would make trouble threatening him. Until she had to leave to save the family from getting involved with his violence. So many incidents have been going on. However the one that broke the Camel’s back is the one that has currently kept Mrs Edobor on Wheelchair. Ivie, could you recall the night that this happened? “On June 18, 2016, my father turned 72. My sister and I decided to throw him a small house party. We all went to my dad’s house and spent the day with him. I arrived back at my house with my children and house helps at about 7pm. I settled my kids at home. At about 8pm I went out with a male friend for a function. We left the function at about 1am and arrived in front of my compound gate by 1.20am. Early hours of June 19th my friend had parked right in front of the gate of my apartment to press the bell for the gateman to open the gate and let me into the compound when suddenly he was rushed at and attacked by a man waving an object. At what point did you realise it was your husband. Our first impression was that it was an armed robber trying to rob us. My friend pushed him away but he came charging back; at this point I looked out the opened door and realised it was John Edobor my estranged husband. Before we could react, a group of area boys showed up and joined him to attack us. Was it your husband that attacked you or the cohorts? They proceeded to beat my friend to the ground giving John the opportunity to focus his attack on me. He used a metal bar (wheel spanner/metal rod) to try hitting me on the head through the opened drivers door but I shielded it. Not satisfied with that, he turned to the passenger’s door and dragged me out to the ground. I landed on the ground with my legs extended where he proceeded to hit me on the leg continuously with the metal. At this time, what was going on with your friend? Non of you called for help? When he was satisfied and was about going back to join the area boys, who had gathered around my friend, that was when my neighbour who had heard my screams for help and saw from his window a man striking someone on the ground. Thinking it was an armed robber, he jumped down from his balcony with a machete. On getting down he was faced with my estranged husband whom he had prevented from entering my compound without my permission on two occasions, so he recognised him. It was at that point he overpowered John. The area boys recognised him (my neighbour) as a member of the security team for the street and backed off. He was searched and a dagger was also found on him. At this point, what was happening to you? You must be in pains ? By that time I couldn’t stand up and my leg was bleeding profusely. I was rushed to the hospital where my jeans was torn off my leg to see the nature of my injury. The injury was so severe that my broken bone torn through my skin puncturing an artery in the process. I had lost feelings on my foot. At a point the doctors had contemplated cutting off the foot as gangrene had started forming on the toes. God being so good, the orthopaedic surgeon decided to take a chance to perform the surgery on the leg even if the artery wasn’t completely healed. How have you healed from your injuries? Almost three months and two surgeries later, I have titanium plates and screws to keep my leg in place and I am unable to use my right leg. I still have my three children to care for and my life is at a standstill. What of your husband? What has become of him since this incident? What is the family doing about this issue? “While in hospital, I gathered that John was arrested on the night of the attack and charged to court by the police the next day. He was granted bail and released three days later. Ironically, the day he was arrested, his family (mother and sisters) that I hadn’t seen or heard from since he sent me packing; arrived Lagos that same day. They saw him at the police station and proceeded to the hospital to see not necessarily concerned about my injuries but to ask me not to charge the case to court. While John was at the station he kept on sending threats and demeaning messages. You must shattered now and stressed out? How are you coping with responsibilities? As I write you now, my hospital bill is yet to be paid by the perpetuator. I have lost the use of my right leg though with physiotherapy and loads of follow ups the doctors are hopeful that I will walk again. I am unable to walk and thus unable to carry out my duties effectively at my place of work. I’m currently on compulsory sick leave till I can get back on my feet unfortunately this will take some time and I am not sure how long my employer will be able to wait for me to recover as my date of full recovery is yet to be known not even by the doctors. Is Zenith Bank aware of all these and what are they saying or doing? I reached out to Zenith Bank via phone text and email and nothing was done. What do you want happen now? Honestly I don’t know. How do I provide for my three children my husband deserted two years ago and I have singlehandedly provided for them as a single parent? How is it possible that the perpetuator of such a violent act moves around freely while my life is at a standstill. I want justice served please. I want my bills paid. The hospital called him to say they won’t discharge me if he doesn’t pay the bill, he laughed and told them to keep me. I’m hoping Zenith Bank will at least clear the bill from his salary. Since he kicked me and the kids out, I have paid all our bills myself including my children’s school fees and medicals because he removed us from his medicals. If I could get Zenith Bank to pay my rent for a year and kids fees just to cover the time when I will be out of work, I will be happy. Zenith Bank’s nonchalant attitude towards this issue has called the integrity of the bank to question, women activists around the world are now making every effort to escalate the matter, calling out Zenith Bank for the world to know what they stand for. Investors and women leaders all over the world are being called to boycott Zenith Bank until it takes it’s social responsibility seriously. Some will question why should a private matter be of Zenith Bank’s business? There is a social obligation for organisations to check their staff excesses on and off duty. Also in places where the law is hard to implement, employers become the easiest and fastest way to call their staff to order. Any organisation who knowingly allows an abusive man to continue to work for them invariably condones the act. Likewise many other moral and social issues. There is a hash tag now on social media, #DomesticViolenceisnotOK #Justice4Ivie #JohnEdobormustgo tweet to @Zenithbank as many times as possible sending them link to this story. Tweet to any women’s right organisations that you know. Every organisation must have zero tolerance for violence from their staff and should express that through strict disciplining of any staff seen to have done such as John Edobor.